Characteristics: Deciduous ornamental tree. Size: Height 40 to 70 feet, spread 30 to 40 feet, final spacing 10 to 15 feet. Neat, upright tree with delicate branching and leaf pattern, beautiful blue-green foliage with tints of red through the growing season. 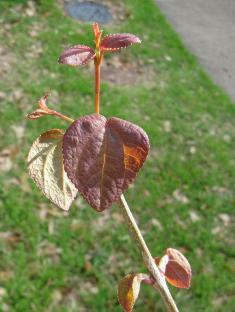 Bark: Young bark and stems are light brown and smooth. Older bark is shallowly furrowed and darker in color. Foliage: Blue-green foliage with distinctively heart-shaped leaves, opposite, from 2 to 4 inches in length with a wavy margin. Purplish when young, bluish green above, lighter below in maturity. Fall color is usually yellow. 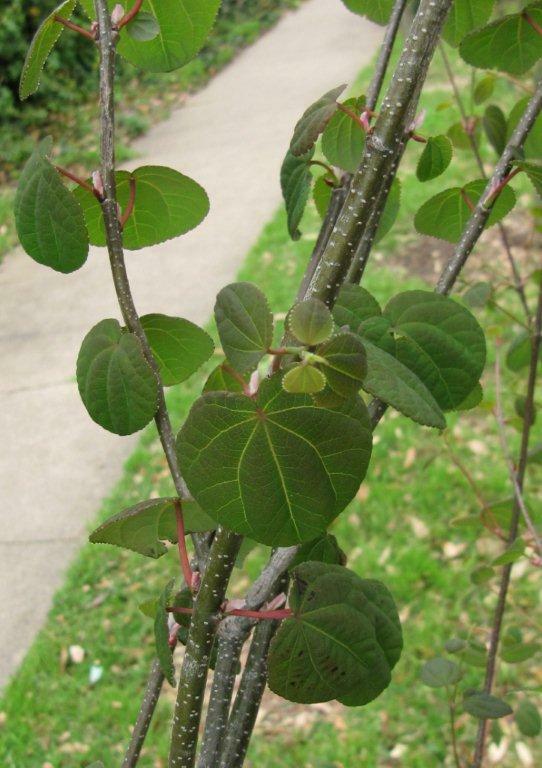 Leaves resemble redbud leaves except they are opposite instead of alternate and the margins are wavy. Flowers and Fruit: Male and female flowers on separate trees (dioecious). Non-showy flowers. Fruit is a small, non-showy pod and also not showy. Natural and Adaptive Range: Native to China and Japan but adapts very well here in Texas to a variety of soils given some moisture and moderate fertility. It grows well in full sun but would benefit from afternoon shade. Management: Relatively easy to grow but does need moisture. Does not handle drought and drying winds very well and tends to get leaf scorch in the heat of the summer in full sun especially in the afternoon. Possible Problems: Few that are serious. Occasional insects and burning from the heat of summer if the beds aren’t healthy and mulched. Propagation: Seed primarily because cuttings are hard establish. Notes: This is a good tree for people to use around swimming pools and in other areas where neatness is a factor. Katsura has no messy flowers, fruits or large leaves to create a maintenance problem. This is a tree that can stand some fairly moist soil. The foliage produces a wonderful chocolate aroma in the summer.